(Long Island City, NY) Freshly made Belgian waffles, whipped cream and fresh strawberries mixed with artisanal food and a festive, almost giddy atmosphere at the Entrepreneur Space in Long Island City on Feb. 11. The food-and-business incubator was celebrating its third birthday, and roughly 30 clients offered samples of their products to about 300 revelers. Everything from the exotic (Brazilian manioc puffs) to the healthy (meatless patties) to the completely unexpected (sassy, handmade dog treats) was on display at this event, which was sponsored by Coffeed, Fairway, SquareWine & Spirits, TD Bank and The Fortune Society. Seen with the birthday waffle cake are (from left) Seth Bornstein, Kathrine Gregory, Melinda Katz, Jimmy Van Bramer, Mariepaule Vermersch, Emily Lin, Larry Sokol, Gail Roseman. There was extra excitement in the air due to the presence of MariePaule Vermersch, who came to Queens from Belgium at age 18 to introduce her family’s waffles to the United States during the 1964 World’s Fair. She happily discussed the wonders of the transcendent fair, which is celebrating its 50th anniversary this year, with attendees and she offered some of the secrets of her doughy treat. 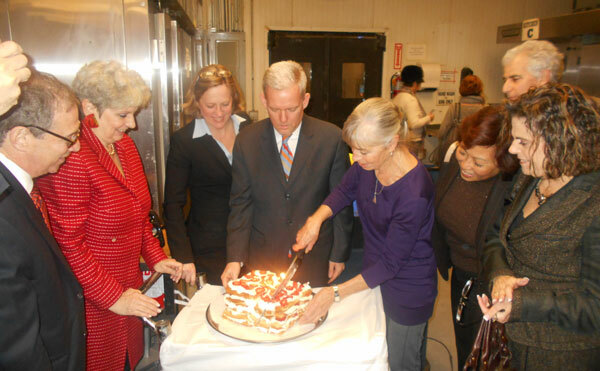 Vermersch also cut a three-layer waffle cake with whipped cream and fresh strawberries during a program featuring Borough President Katz, City Council Majority Leader Jimmy Van Bramer, QEDC Executive Director Seth Bornstein, Kathrine Gregory from Mi Kitchen es Su Kitchen and various QEDC board members. The night’s other special guests were graduates of The Fortune Society’s Culinary Arts Program, which trains former inmates at the E-Space so they can get food-handler credentials and hands-on food-preparation experience before entering the workforce. Located at 36-46 37th St., the E-Space officially opened on Jan. 19, 2011. This 12,500-sq.-ft., NYC Economic Development Corporation-sponsored hub features a fully equipped commercial kitchen, offices and classrooms that entrepreneurs can rent at below-market rates as they build their businesses. To improve outcomes, QEDC also offers a wide array of business counseling, technical assistance and financial classes to clients on site. Currently, the E-Space has over 165 clients, including bakers, an employment firm and an insurance company.